Here we are... what now? Aswan: Lake Nasser, Abu Simbel, Kitchener’s Island, souqs, feluccas, temples, museums - the possibilities are endless. 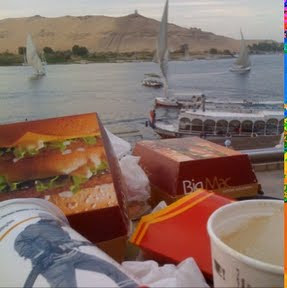 Most people who come to Aswan rush from sight to sight, aware that they only have a few days to see it all. They sit in a cafe drinking mint tea, for the experience. They stroll down the corniche, for the view. They drink in the sounds and smells of the city, because they are leaving far too soon. We, on the other hand, are landed here. Of course we were going to spend a day or two, recovering from the Wadi Halfa ferry, taking a look at the temple of Philae, meet up with Alex. But basically this was our entry and moving-on point for Egypt. Instead, thanks to Eid al Adha (ironically a celebration of sacrifice), we are stuck here waiting for our car to catch up with us from Wadi Halfa. This gives us a whole different view on the town. Instead of an exciting holiday destination it has become a temporary home for our lost souls. Street vendors quit the banter and nod sagely when we tell them we are here for the duration, the hotel is promising a good room for the long-term tenants, and walking the streets we are more interested in the location of the cafe round the corner and the shop selling phone credit than the pretty view or the souvenir bargain. We are having MacDonalds on the waterfront, I am afraid. 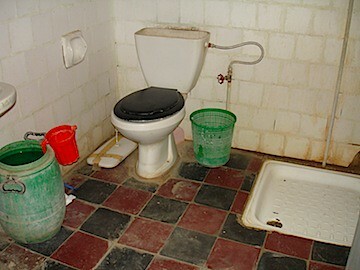 Overcome with the need for some perverse familiarity - and free wifi as well as spotless toilets. At least the sunset is home made Egyptian. 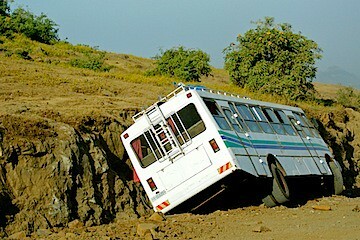 It seems most overlanders go through this: before you start you make a plan. You pore over maps, read guide books, google locations, make top ten lists of places to visit. Then you leave and it all changes anyway. You meet other travellers who tell you about that beach, that park, that camp site you HAVE TO go to. So your route changes a bit and it’s all good. But then comes that moment when you make a mayor change. Like the Irish cyclists we just met who couldn’t get visas for Sudan initially so instead of travelling Ireland to Cape Town they went Addis to Cape, and then, when they could get the Sudan visa in the end, they flew back to Addis to carry on the rest of the way to Ireland the other way around. That’s thinking outside the box. So long story short, after a lot of back and forth we have cancelled our Tunisia-Italy ferry, have sacked our Libya fixer and have decided to hang a right in Alexandria, travel through Jordan, Syria, Turkey, Greece and the Balkans to Germany. Shouldn’t take too much longer and we have the satisfaction of having done it all by road. Let’s just hope the Balkans in January isn’t that cold (yeah, right). So if you are interested, the calendar is updated with approximate new dates (you can see the calendar at the bottom of the page). Of course, until we are re-united with our car we have no idea how long we will spend in Egypt, and therefore all dates are highly flexible. This lady will make you a coffee or tea you will never forget. She has cinnamon, mint, cardamom or ginger and she's not afraid to use them. On the left she has a small charcoal burner where she boils the water and a bowl to wash up the tiny glasses and chased silver tea pots. Her assistant, a young boy with a tea tray, runs through the market to deliver orders hot and fresh. There's always time for tea, as we found out in our few days here. EDIT: Now as moving pictures! How to...Make Coffee - Sudanese Style from Fiver Löcker on Vimeo. 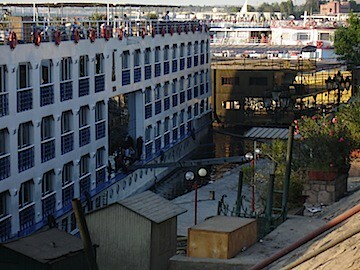 We have boarded the Wadi Halfa ferry from Sudan to Egypt. The fact that it's a few days before an Eid holiday is good and bad. Good, because the ferry is quiet and we are avoiding the crazy rush of people and goods being loaded that everyone warned us about before. Bad because we had to leave Sally behind since she goes on a separate barge and that only runs when there is cargo coming from Aswan. Because of the holiday all trading has stopped so no barge. It's all very frustrating having to leave her parked in the customs compound, but Magdi has promised to look after her and drive her onto the barge when it finally comes. As it turns out the ferry isn't so bad. 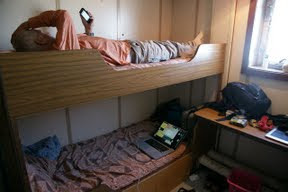 The cabin has air con and is cleaner than some hotel rooms we've slept in, there is power and we are in the right side of the boat for Abu Simbel, which we should pass this evening. There's space on the deck to walk around, and we brought food and water to keep ourselves in good spirits. Now all we have to do is get to Aswan and wait for normalcy to return so we can get our car/home back. They are not so well known, they are steeper and smaller, they were built later and not by the Egyptians, but there's lots of them and wow, they are stunning. 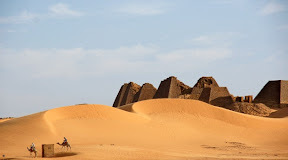 The pyramids at Meroe and Jebel Barkal and the assorted lion, Amun and Nut temples are hardly visited, lying a day or two north of Khartoum they are not that accessible, but going there is so worth it. Some structures are badly damaged, deep grooves showing the strength of sand and wind over the millenia, but on the inside of temples we saw lions and crocodiles crouching at the feet of queens and godesses, kings offering lotus flowers to ibis headed gods, prisoners leading elephants, broad shouldered warriors. It does feel like the end of the earth. Silence at the port today will undoubtedly give way to noise and craziness on Wednesday when the ferry leaves. For now all is locked up, the tea lady has gone home early and there is only the slow drip of the water butts leaking onto the stone to keep us entertained as we wait for our fixer to return. In two days, Inshallah, Egypt. Until then, the end of the earth. 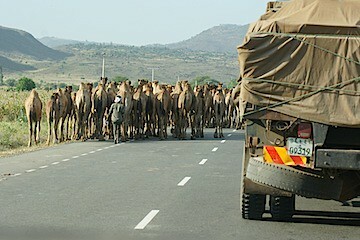 Arriving in Ethiopia, after the Marsabit road ordeal, was like returning to the real world from a wild and (potentially) dangerous frontier. On the Ethiopian side of the border there were hotels and tarred roads, and the metropolis of Addis Ababa beckoned. 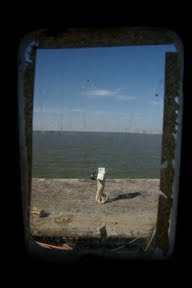 We had not made it to Lake Turkana - another time - but we had got as far as the remote and mysterious land of Abyssinia. And it defied all our expectations. We had heard conflicting views from fellow travellers coming south: it's amazing, beautiful, exotic, with friendly people and delicious food. Or: Ethiopians are horrid, they hate foreigners, stone throwing and pushy begging is the norm. Ok, so everyone either loved or hated Ethiopia, everyone had a strong opinion. What was it going to be for us? From Moyale with its dreary hotel we drove straight up north, not looking left (Omo valley) or right (Bale mountains), and finally stopped at Awassa, a workaday town on the edge of a Rift valley lake. Another few hours hop took us to Lake Langano (there is a sting of lakes following the Rift Valley south), where we finally found a place we wanted to stay for a few days. After getting the car fixed up in Addis Ababa and procuring more cash in preparation for ATM-less Sudan (http://rabbitproductions.blogspot.com/2009/11/more-money-lessons.html) we left for our version of the historic northern loop, and the mystical rock-hewn churches of Lalibela (http://rabbitproductions.blogspot.com/2009/11/lalibela.html). Leaving the Rift Valley behind us for the last time we scaled the highlands to Gonder and a few quiet days at Lake Tana with Tim and Kim (www.timandkimvillage.com). And that was Ethiopia. We spent almost three weeks, but it felt like days. As it turned out the people were stunningly helpful once we got to talk to them, but if we just stopped by the road to look at the view or dive into a shop, we would be crowded, people staring with no sense of allowing for personal space, and once we did have a stone thrown at us from nowhere, and good shots that the Ethiopians are (they use slingshots to keep the birds out of the fields) they hit one of our new solar panels. So there is a weird disconnect between people who couldn't do enough for us (hello, Global Hotel), people who gave us their insight into Ethiopia (Thanks, Tim and Kim, Getaye, Alex, Zabene, Zegaye, Daniel) and the anonymous stone thrower together with the never-ending phalanx of children shouting "Gimme Money!" 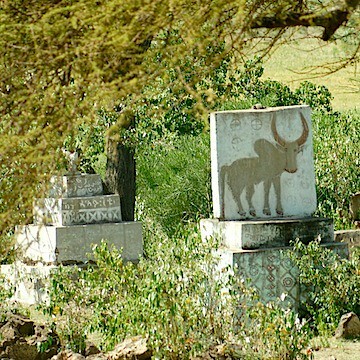 Like many other things in Ethiopia, it remains a mystery. Ethiopia was surprising vistas of mountains, endless hills and valleys covered with fields and grazing; it was eroded volcanic plugs sitting in the midst of fertile lands like squatting giants; it was another beginning for the Nile (the Blue Nile this time) from Lake Tana, which carries 90% of the water that keeps Egypt alive; it was tea coloured lakes languishing placidly in the valley of the Northern Rift, surrounded by nothing much more than silence. Ethiopia was the last we saw of the Rift Valley, a geographical feature we had followed north ever since we arrived at the slice of water that is Lake Malawi, and what a goodbye it was: twisting Italian-built roads took us up and up and up to the cool and windswept highlands, looming mountainsides tamed by the need for farm land with terraces and small irrigation projects, coffee farms with their drying frames, and endless villages along the road, houses fenced by cactus or acacia hedges, herders with goats, donkeys, humpbacked cows, camel caravans and the ever present women carrying water containers from the pump to their homes. Ethiopia was also surprisingly developed. The road infrastructure was new and well-maintained and where the road was unfinished we saw constant work: graders preparing surfaces for new tar; men and women tightly wrapped against the wind and dust carrying large rocks to the side of the road; diggers far below chomping holes for drainage and culverts - a strange mix of high and low tech. Most of the country seemed electrified, judging by the ever present cables running alongside the roads and into the hills. 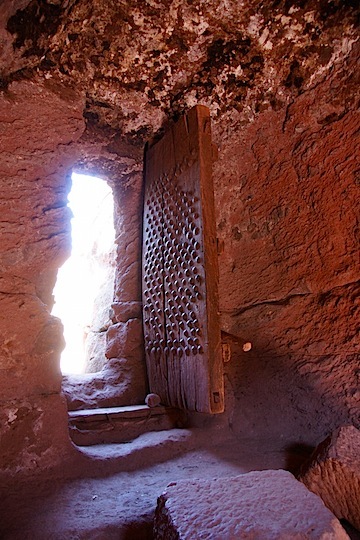 In fact, when we were in Lalibela, it was a surprise to see the outline of the village by the lamps shining in the windows, a sight we had forgotten since the long-ago days of Namibia. The mobile network is so-so, but considering the remoteness of many places it's amazing it exists at all. Since the internet relies on mobile networks, we were cut off from our web fix for ten days, giving us a nicely disinterested view of the world for a while. We saw school children in uniforms every day (although we found out that schools teach in two shifts, which can't be good for the quality of teaching). As opposed to most of Africa we found that pretty much anywhere had running water, but in keeping with most of Africa, hot water was erratic and water pressure, well let's just say it was not all that. Ethiopia is unique in Africa: a script with 200 characters that looks like something JRR Tolkien might have invented; octagonal churches topped by elaborate crosses and filled with fantastical frescoes like involved comic book stories; very varied building styles, from huge rondavels to two storey Tukuls, from groups of neat square huts surrounded by high walls with elaborately painted front gates to peaked reed domes topping the central house in a compound, as well as faded Italianate rows of flats and glass fronted skyscrapers in Addis Ababa. Its people, half African, half Arabic with a different look altogether: lighter skinned with angular features, tall and handsome in a new way; a long long history (dating all the way back to King Solomon) intersecting with the empires of Egypt, the rise of Christianity, with Portuguese as well as Indian influences, mentioned by the Greeks and Romans as the faraway land of Punt or Abyssinia. Ethiopia has a palpable identity we have missed in previous countries with their indelible impression of colonialism and not much remembered history before that. 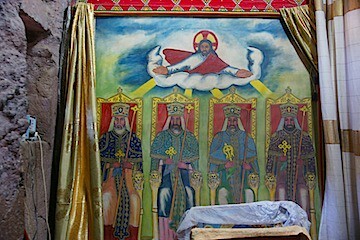 Here there is a church that has been keeping records for a thousand years, there are artefacts from former glorious times, there was a royalty until recently that counted its (imaginary, but nevertheless respected) roots from the mystical love affair of King Solomon and the Queen of Sheba. Like Egypt, Iraq and China, there is a pride in having been one of the first great civilisations, and in this case we had the added pleasure in finding a culture that has not been turned into clichés (it's hard to look at Pharaonic culture and not see The Mummy). A short bit of information about mobile data, my favourite travel obsession in Africa. After having data access in Botswana (Orange), Zambia (Zain), Malawi (Zain), Tanzania (Zain), Kenya (Safaricom) and Uganda (MTN, expensive!) it was disappointing to find when we arrived in Moyale on the Ethiopian border that we couldn't buy a SIM card until we got to Addis Ababa. A whole week without Facebook, email or news feeds. How would I live? When we got to Addis one of the kind people at the Global Hotel procured a SIM card for me, which was just as well as even for a pre-paid card you need proof of local residence. Not easy for travellers, then. Credit was easy to get, as there is only one mobile phone company (Ethiopian Telecoms), but to my great disappointment there was no mobile data for pre-paid SIMs. Ever since Botswana I have been able to get email and other internet on my phone with just a pre-pay card, so it was a surprise that Ethiopia didn't have that service. I don't think it's to do with local demand, as even a very poor country like Malawi provided mobile data, it's just built into these modern mobile networks. Oh, well, so much for monopoly suppliers! The real bummer was that even in the places where there is nominally reception we couldn't make calls, because the power supplies for the mobile phone masts were down. Lalibela, where we spent a few days, and which is a mayor tourist attraction, had no mobile phone access while we were there, which was really hard for the local guides and other small business people, as everyone relies on contact through the mobile since no-one has a landline. Sudan on the other hand was a blessing. We still didn't get a SIM until we got to the Afra Mall in Khartoum, but there we found our old friend Zain, a Kuwaiti company covering 12 countries in Africa and the Middle East, who set me up with a pre-pay card and mobile internet (APN 'internet', no user name and password!). Sweet. I still needed to fill in an application form and show my passport, but I put that down to Sudanese love of bureaucracy and tracking what people are up to (until recently you needed photo permits to take pictures of the Northern pyramids and registration every time you stayed in a new town, very Soviet). Pre-paid mobile data is not cheap here - I have used €30 in 6 days, but that included ordering books on Amazon while driving through the desert, so I guess I am paying for the convenience. I have a SIM card for Egypt, but am not holding out much hope for data, as I know the Egyptian authorities are not too keen to have its people connected (iPhones sold in Egypt don't have GPS, for example). I will keep you posted. We call their tents pimples. 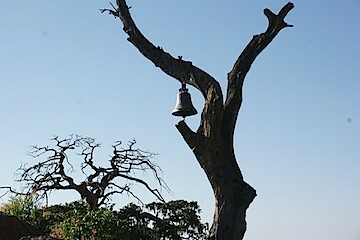 They usually show up late and leave very early, and they make such noise that they wake every honest sleeping camper. They travel from Nairobi to Cape Town in 6 weeks and stop to take group photos at the equator. Their big trucks are orange, but manly with huge wheels and customised storage for kitchen equipment and tents. 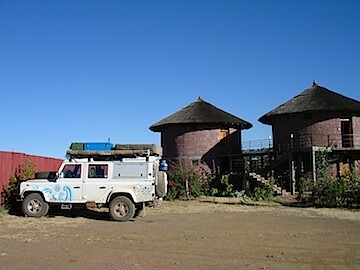 They are the overland trucks, carting the gap year youth of the Western world through the wilds of Africa. In the evenings the girls congregate in the toilets for make up sessions and the boys strut their stuff in their low hanging boxers, just like preparations at home for the Friday night clubbing experience. I wonder what these people carry in their luggage, because we certainly don’t have space for more than one decent outfit per person. At Guma lagoon they used all the hot water, and in the Mara we found ourselves listening to complaints about the shortness of the toilet breaks during the trip. At Track and Trail camp in Zambia a catastrophe was narrowly averted when a group of American youths cornered a passing elephant to take photos and refused to take the mock-charging and flapping ears seriously. A local ranger told them they could stay and eventually be trampled or slowly back away and show some more respect for the wild life. Occasionally we meet groups of more mature travellers, a sign that overland trucking has become a more acceptable form of holiday travel. 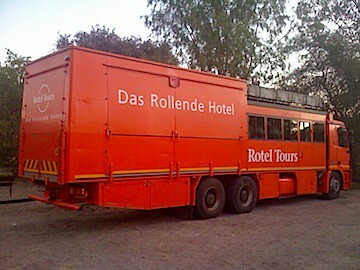 In Botswana we encountered the Rolling Hotel (above) which was novel in that the tourists didn’t have to put up their own tents, but slipped into a Japanese hotel style cubicle in the truck itself, a claustrophobic experience, I imagine, but it does keep you away from mosquitos and creepy crawlies. Luckily they move on fast, so when they descend on us at a camp site or resort, we just have to stay put and they will be gone again. Now that we have reached the countries considered more volatile we have left these types of organised tours behind. Everything financial had been working so smoothly for us all through Malawi (despite its' scarcity of ATMs), Tanzania, Uganda and Kenya, that we forgot that replenishing our funds was not always straightforward. Rumour had it that there were only two ATM locations in Ethiopia (in Addis and Gonder) and none in the whole of Sudan, which has had sanctions imposed so that VISA and Mastercard didn't work anywhere. We neglected to get more US dollars in Nairobi (which are always useful for changing money in the unofficial market), and when we got to the Ethiopian border we somehow managed to change too much of our US dollars into Ethiopian Birr. It was only when we reached Addis, hoping to draw more money from the ATM and change it to US dollars in preparation for Sudan that we found out how scarce the greenback is in these parts. I had a kafkaesque encounter at the bank and forex where I was told that there was only US$150 available per person, but only when showing and airline ticket leaving the country. When I told them that I had arrived and intended to leave by car I was firmly assured that this was not possible, no-one arrives by car into Ethiopia. Luckily the very pragmatic sales manager of our hotel used his contacts to procure us US$1000 for a fair rate and even got the guy to come to the hotel so that we could safely make the transaction. Rumours were correct and the only other ATM was in Gonder. Having stocked up with US dollars in Addis, we were more concerned with acquiring Sudanese Pounds at this point as we were on our way to the border. 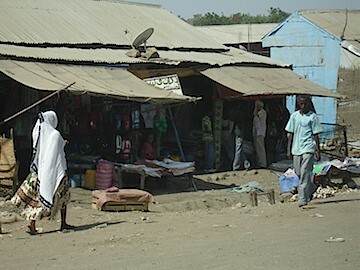 When Stuart visited the bank on the Ethiopian side of the border (money changers were strangely missing from this otherwise busy border crossing) he was referred to the bag shop across the road where a guy changed our excess Birr into a few Sudanese Pounds. This was enough to get us through our custom expenses and to pay for the toll on the Khartoum road, but not enough to pay for the Nile hotel in Wad Madani, even after we had bargained them down from 90 to 60 SP. 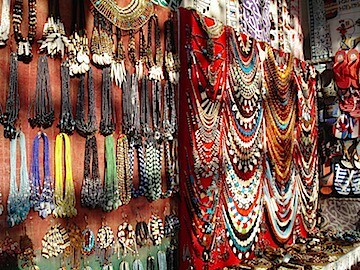 We had read that it was possible to change money in the souq at the goldsmith shops, so we took a walk in the mild evening air. 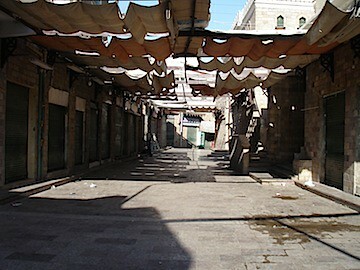 It was easy to find the souq, although at 6pm not much was happening yet. Some non-verbal communication with a Quran-reading goldsmith later and we were sent to see Ahmed round the corner. Ahmed had a future as an extra in a Harrison ford adventure movie, sitting fat as Jabba the Hutt in front of his safe, counting thick wedges of various currencies. In front of him a desk laden with ledgers and receipts, flanked by hangers-on, he shook our hand and was happy to do business. In between handing out rubber-banded chunks of cash he offered us a reasonable rate, but before we could complete our transaction with this unofficial banker the communal dinner arrived and we were urged to take part. A huge metal bowl of foul (a mix of pita bread, tomatoes, cucumber and cooked beans with lots of spice) was placed on a table and everyone tucked in - right hand only. We were then served cool clear water in bashed metal mugs and, finally, our very own chunk of cash. 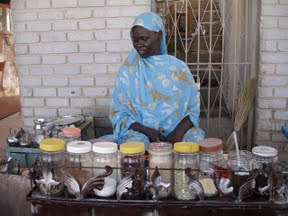 Now, in Khartoum, we realised what a good idea it was to equip ourselves with plenty of cold hard cash, as we have met two groups of overlanders going south that have to hurry to Ethiopia because they are running low on money. I hope the cyclists make it to Gonder before they are broke. Yay for Khartoum's Afra Mall, where we scored free Internet, a SIM card with data and these delicious cakes. It's true that Ethiopia had good cages with fresh juice and divine coffee, but the cakes were still a bit hit and miss and often not the freshest. Here, there's chocolate and cream and glacé cherries. Yum. Most of this trip has been a camping holiday for us, equipped with a roof tent and the Hilton (our sturdy Coleman family tent big enough to satisfy any Kiwi camper) as well as a small pup tent borrowed from my brother, we always had lots of sleeping options. Occasionally we treated ourselves to a room (or it's my birthday and I am forced to spend it in a five star hotel), but mostly camping worked out well, because the countries we visited catered to campers. Level sites, a bit of grass, shower and toilet were usually provided, and sometimes we got so much more. Not so in Ethiopia. The concept of camping doesn't seem to have reached here, so most camping takes place in the courtyards of the numerous hotels (Ethiopians must be prodigious travellers, judging by the number of hotels in every little village, and the number of people walking along the roads or perching on the back of trucks). Unfortunately the fact that we don't use the rooms doesn't have any impact on the price, we are always charged the same whether we camp or stay in a room. 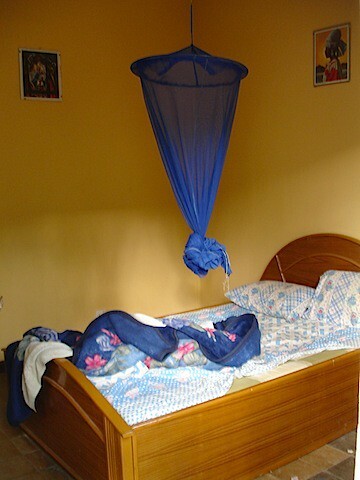 If the rooms were clean and comfy, we would be happy, but we have had the range from unfinished, grotty, uncomfortable, cockroach infested to badly maintained, slightly dusty and raw electricity cables hanging loose. What's strange is that while the rooms are mind-bogglingly furnished, with plaster falling off the walls, curtains that don't cover the windows, doors that don't shut and tiles that are broken, mis-matched furniture and randomly rigged wiring ( usually close to some running tap), the staff in all the hotels have been beyond nice and helpful. No-one ever understands our frustration with the non-functioning hot water or the lack of towels, but they are always more than happy to move us to a new room, bring us towels, buy us SIM cards or arrange for black market US dollars. 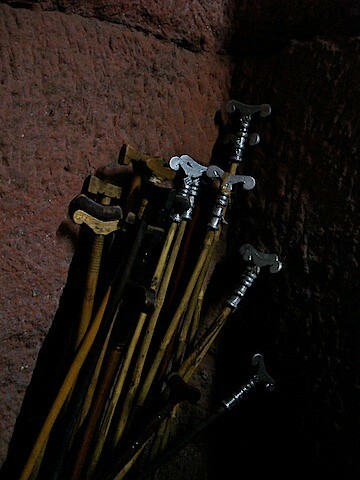 The one time we hit the jackpot was in Lalibela, and all thanks goes to tripadvisor.com, where we found updated recommendations that were better than the guide book entries. The Tukul Village hotel had big rooms and even bigger bathrooms, a hot shower and white sheets on the comfortable beds, a balcony looking out over the town and best of all it was all finished. No concrete floors in the bathroom or missing fittings, no raw power cables or loose door knobs. We could have cried, and we did stay longer than planned just to enjoy the novelty of a clean room. The hotel was new, and so was the other pleasant place we stayed, The Sabana resort at Lake Langano. It boils down to maintenance, we have decided, the same lack of upkeep that have made the railways unusable, roads fray at the edges and get pockmarked with potholes, that mean perfectly viable buildings just disintegrate over time and most aid projects fail if there is no contingency made for long term servicing. This is why new hotels are nice and old ones are always described in the guide books as having 'faded charm' and 'former grandeur'. 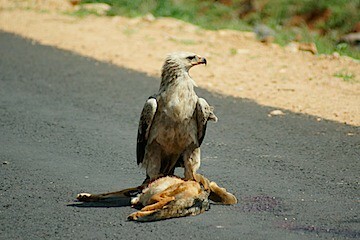 Road kill is rare in Africa - not enough cars - but when it happens at least there is an impressive raptor to clean up the mess. Graves are often set next to the road and topped with images of wealth and power to show off the importance of the deceased. 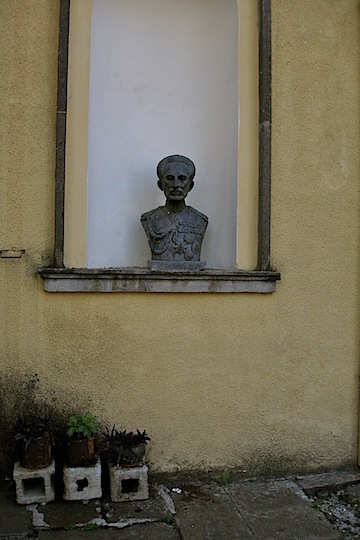 There are places where Haile Selassie is still remembered - this outside the National Museum. As many women as men are occupied on the many road works to upgrade the failing Italian road infrastructure. Someone is having a bad public transport day. 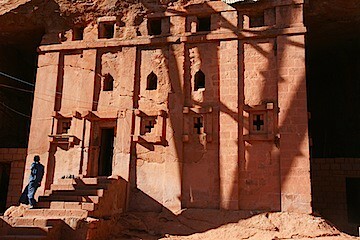 I had little pre-conception about the 8th wonder of the World, the rock hewn churches of Lalibela. They were 12th century, so I imagined little hovels of stone. 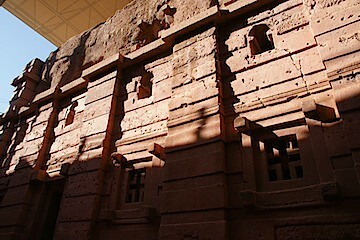 They were carved from the rock, so I imagined a facade like Petra in Jordan. What I found could not have been more impressive, breath taking and unlike a medieval Petra if it tried. 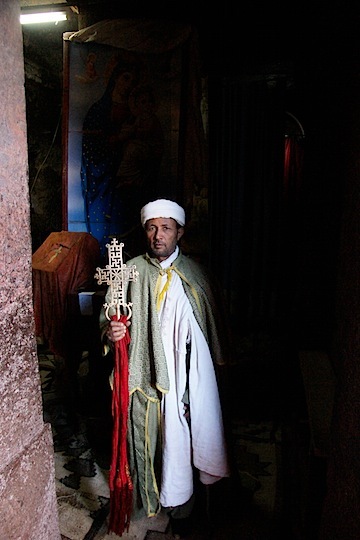 Lalibela is suffused with religion in the most lively way. Our guide was a chanter and our receptionist was up at 6, wrapped in his white shama on his way to pray. Young boys from the countryside dream of growing up to become priests, who are part of village life with their wives and families (unlike Catholics, Ethiopian orthodox priests are allowed to marry). 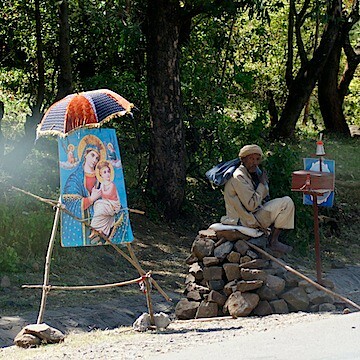 Orthodox religion is fused into people's lives for better or worse (the church is the only entity in Ethiopia apart from the state that owns land, so there is little incentive to raise the peasants above their current level of ignorance and poverty), there are churches in every small village, priests are sitting by the side of the road soliciting donations and dispensing blessings, flanked by a picture of Mary, a donation box and a shiny umbrella. I had thought of Ethiopia as a remote and unreachable place, like Albania or Tibet, never to be seen by me, so reaching Lalibela was unexpected, despite being on our route from the beginning. We arrived there after two long days of driving on gravel roads through the mountains north of Addis Ababa, breathtaking views and old Italian-built roads and tunnels making us think we were in the Alps. We were tired when we got there and debated whether it had been worth it, but our visit to the churches the next day wiped that question from our minds. The churches are by the nature of their architecture not really part of the village, but sited separately in three locations in the hills. They are quite invisible from the road, apart from the protective roofs that have been built over them to protect the rock from weather. The churches are really underground, carved down into the softly pink volcanic tuff that once flowed over the region and hardened like raspberry meringue. To create the churches first a trench was excavated around a square block of rock, which was then pierced to create the interior of the church. This makes the buildings flush with the rocky ground. Access to the churches is via the trenches surrounding them, which are kept scrupulously clean by troops of cleaners, who remove dust and lichen that may damage the buildings. The churches are still in a poor state, a mystery to me as they have been in constant use for the last 800 years, owned by a living church that doesn't look short of money in other ways (something like 700 priests, monks and apprentices are directly employed by the church in Lalibela), There are cracks in the facades from a 17th century earth quake, badly executed maintenance from previous regimes and general decay inside and out. Regardless, the space is quite unlike anywhere I have been before. After descending into the trench we faced an awesome building, Bete Medhane Alem, the biggest rock hewn church in the world. It's incomprehensible to me how an architect, a sculptor, a builder could think themselves into the negative space to be created, where instead of erecting a new construct a solid shape had to be hollowed out, detracted from, with all the implication that once something is removed it can't be added back in. The amazing thing to me is that the churches look like real buildings (they even have fake wooden window supports, copying a local contemporary building style, even though, being stone, they are not needed), with windows and doors, pillars, steps, internal arches and decorations, drainage and storage spaces, seats and ledges. Walking around the first complex of churches (there are three), with its 6 churches all tangled up with walkways and staircases, trenches connecting each to the next, holes in the walls that used to give homes to hermits and mummies, dead ends and hidden entrances, one is completely cut off from the day above, it's cold and dark where the town is hot and dusty, its quiet where the town is full of children on their way to school and touts drumming up business. Stepping inside a church is even gloomier, and there is a strange absence: paintings draped and drums abandoned on the carpet where the chanters left them after morning service; empty benches where worshippers crowd in the mornings; curtains drawn on the altar and holy shrine, not to be revealed until the next mass; carpets rolled up awaiting a holy day so that they can be unrolled to spruce the place up. 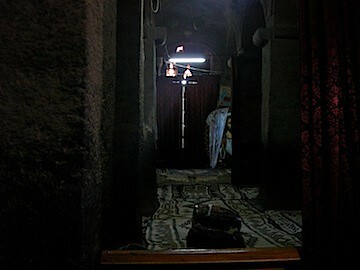 The lone priest sits in vigilance waiting to display the churches cross to visitors, and reads his prayer book. Some of the churches are decorated inside, apart from the paintings propped everywhere, mostly new prints of saints, although some are painted on cloth and look to be no older than a few hundred years. They don't seem to be valuable, maybe they get replaced when they wear out, the image more important than the craftsmanship. Bete Maryam has carved and painted patterns covering the pillars and a series of cartoon like frescoes depicting miracles and the annunciation. They are easy to decipher, in a naive style with simple symbolism so even I could keep up. 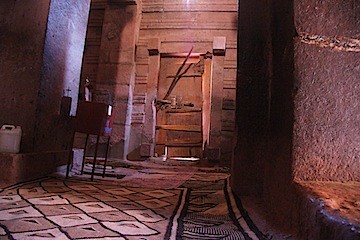 The interiors are quite dark, making for moody shots of light streaming in though door ways and touching the edges of pillars, illuminating rather than lighting. What light falls through the small windows and doors is already diminished by the fact that we are underground, with a canvas roof over our heads. A few cold strip lights are haphazardly rigged under the ceiling, wires strung across frescoes and in and out of window frames. This gives a utilitarian feel to the mysterious gloom, harsh electric light cutting through the dark with white smears. The light creates rooms different from the physical space, highlighting a folded up carpet or the corner of a painting, giving importance to disjointed parts of unrelated objects. In amongst all the theatrical decorations, the drapes and images, sits the priest, sometimes busily chanting from his prayer book, sometimes dozing until the guide suggests that he display the church's treasure. Then he poses in a lit space in front of the picture of his saint, all solemn seriousness clad in white, draped with a colourful shawl. Posing over, he plonks the cross down on a stool, covers it with a cloth and returns to his meditations. Supplementing the power supplied by our second battery (to prevent the primary battery from being accidentally run down while charging laptops and such) has been an aim for a while now. We were constantly running into limitations of our admittedly large electricity needs, specially when we were parking up for a few days, so the engine couldn't recharge the additional battery. 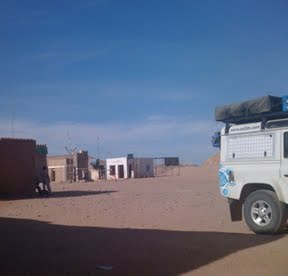 Our workaround consisted of a combination of incessant searching for mains power (not always easy in countries where even the power supply for locals isn't constant), always charging when on the move, and occasionally running the engine for a half hour when the inverter started beeping. It didn't help that the deep cycle battery was of lower capacity than we would have liked, and, as we later found out, wasn't a sealed unit, so at one point had actually run dry. Ever since Maun in Botswana we were looking for solar panels to fit to the roof. Finding solar panels is not a problem in Africa per se, as there is a slow and steady development towards self sufficiency with electricity in the face of governments' inability to provide its citizens with a reliable power infrastructure. The problem is getting the right size and capacity to fit a car roof, where most panels are built to supply a household and be propped up on the ground. 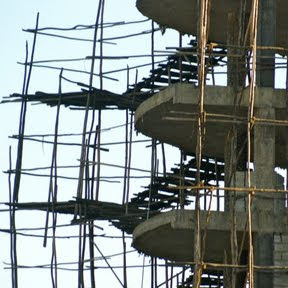 So we looked again in Lusaka, and in Dar es Salaam, but kind of gave up eventually. At last, in the unlikely location of an upmarket shopping mall in the embassy district of Nairobi, while looking for a rechargeable torch, we came across a system just small enough and light enough in size and sturdy enough to withstand the bumpy roads, and now we are kitted out with a full 36 W set of three small panels screwed to the lid of one of our roof boxes, plugging into a controller and then into the new deep cycle battery we acquired in Marsabit. Unfortunately the Ethiopian habit of throwing stones at passing cars meant that two days after finalising the wiring and making the setup work we got hit and cracked the glass cover on one of the panels, reducing our capacity. It's fixable, though, and luckily was the only stone throw we received. Today is not November 7th 2009, today is 28.02.2002. Ethiopia is way behind in many ways, and most noticeably with the date. 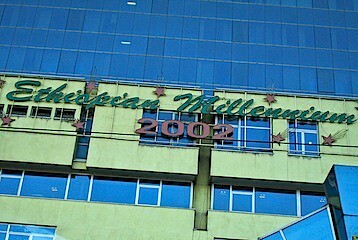 The millennium happened only just over a year ago, so Addis Ababa is still festooned with celebratory messages. Oh, and 9am is 3 o’clock and 1pm is 7 o’clock, because just as the Maasai time starts being counted from 6am (time of sunrise more or less all year round, being so close to the equator). So arrangements can get a bit confusing. 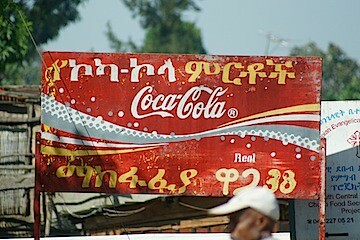 Luckily the Ethiopians seem to be able to adjust to our ignorance and use European date and time with us. Thanks!